I'm glad everyone enjoyed yesterday's post. I have another wedding related post. By now, you guys must be familiar with "Mascara Melissa". As one of my closest friends, she gets the opportunity to be made up for all her special events. Melissa was attending the wedding of a friend from high school. She hadn't seen a lot of the guests in years and of course wanted to look hot! Melissa was wearing this gorgeous olive green dress with a gold sheen and she wanted her makeup to coordinate. 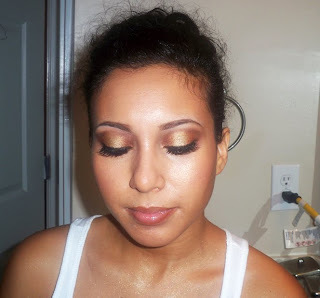 She decided on a Greek Goddess look...or bronze and gold. I did a different technique on her where I shaded the inside and outside corners and highlighted the middle. I added a tiny bit of liquid gold glitter on the middle of her lids which looked so pretty in person...but hard to capture on camera. Ah well! I didn't include a pic of her with her eyes open because the quality came out weird. However, you can click on the picture to expand and see the eyeshadow better. I like that - very pretty. Hey would you do a vid tutorial on this look. I love how the gold looks, I owuld love to kn which paint pot you used. Love it! Melissa is so cute!